· EASY AND STABLE TO FLY: 2.4G adopted technology prevents interference from other drones or transmitters. The built-in 6-axis gyroscopic stabilizer ensures a precise position for better performance. Fast / slow speed function makes it easy to control for beginners and toddlers. · HEADLESS MODE and 3D FLIPS: Headless mode eliminates the difference in the direction of drones, the direction will be the same as that of the transmitter. The 3D Flips feature lets you explore more exciting acrobatic actions with Syma X20-S.
· ALtitude HOLD and LED LIGHTS: Built-in barometer to set the height and the drone will move to that height in the air when the left joystick is released. LED lights make the drone an eye-catching night flyer. · LOW VOLTAGE AND OVER CURRENT PROTECTION: When the drone battery is low, the two indicator lights on the back of the drone begin to flash to remind the pilot to call back the drone to avoid losing problems. If the drone finds an emergency in which it can not work, for example, the blades are not spinning, it will go to the overcurrent protection mode. 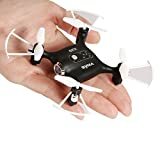 · Specification: Brand: Syma Model: X20-S Product Size: 10.50 x 10.50 x 2.50 cm / 4.13 x 4.13 x 0.98 inches Quadcopter Battery: 3.7V 180mAh Li-Polymer Battery (Recessed) Transmitter Battery: 2 AAA Batteries (Not Included) Control Distance: About 20m Built-in Gyro: 6-axis Games Types: RTF Level: Level Beginner Wireless Remote Control: 2.4GHz Channel: 4 Channels Radio Mode: 2 Mode (Left Throttle) Compatible with Gimbal Additional: No | Flight Time: 4 ~ 5mins Charging Time: Less than 50 Minutes For Ages: 8 + Package Included: 1 x Syma X20-S Drone 1 x One-Handed Remote Control 1 x USB Charging Cable 4 x Spare Propellers 1 x Manual use Important tips: 1. Suitable for pilots 8 years or older and use under adult supervision. (Follow the user manual carefully) 2.We are the authorized seller of the Syma brand and 100% guarantee that all our products are original.